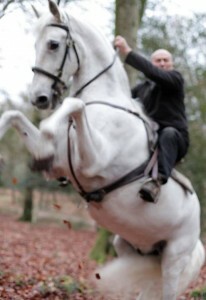 Mike is widely experienced with all manner of horses. He has jousted in full-plate armour, flown falcons from horseback, and shot an assortment of bows – from the Japanese yumi to the Turkish recurved bow from galloping steeds. He has shot guns from horseback. He is experienced at various skills-at-arms such as ring-titling and tent-peggging. He has driven chariots across the desert sands of Egypt, driven stagecoaches into mock Western towns the USA and driven medieval carts in Europe. For a television programme about the Peasant’s Revolt, he once rode from Canterbury to London, assessing the difference between travelling on modern horses (walk, trot, canter) and a medieval type of travelling horse with its fifth ‘ambling’ gait.